Prequel? Reboot? The origins film has Caesar (Andy Serkis) becoming the first ape to say “No!” and leading a Spartacus-like revolt against human captors. Who, in their right mind, would have left Draco Malfoy in charge of a sanctuary full of resentful, super-intelligent primates? Although set in and around San Francisco, the film was made almost entirely in Vancouver, British Columbia, though the opening capture of wild apes was filmed on the island of Oahu, Hawaii. Interior sets were built at Mammoth Studios in Burnaby, just to the east of downtown Vancouver, which has also hosted filming for X-Men 2, X-Men: The Last Stand, Fantastic Four, The Chronicles of Riddick and Night at the Museum. There are enough references and in-jokes to distract Ape geeks from some clumsily hurried exposition in the first half of the film. The virus which supposedly helps the regeneration of brain cells is called ‘ALZ-112’ – referring to the 112-minutes running time of the original Planet Of The Apes (in the original script, the virus was even called ‘RT-112’). 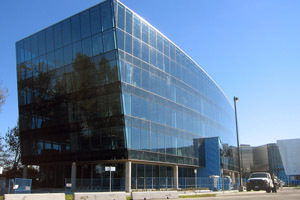 The ‘Gen-Sys’ research facility, where Will Rodman (James Franco) conducts experiments to help combat Alzheimer’s, is the Aerospace campus of the British Columbia Institute Of Technology, 3800 Cessna Drive, in Richmond, alongside Vancouver Airport. Rodman supposedly shares a home with his ailing father (John Lithgow) in one of San Francisco’s picturesque Gingerbread houses. Although the the British Columbia Film Commission isn’t allowed to reveal where this is, it’s not difficult to recognise one of Vancouver’s landmark Victorian houses. 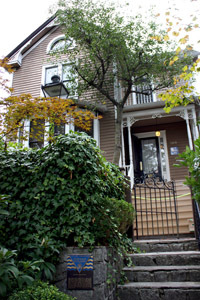 The home where Caesar grows to maturity is the Davis House, 116 West 10th Street, in the Mount Pleasant district. The oldest of a row of Heritage houses, the Davis House was beautifully restored in the 1970s – though Caesar’s quirky circular window was added for the film. It’s a private home, and I’m sure I don’t need to remind you not to disturb the residents. Caesar is taken out to ‘Muir Woods’, the Giant Redwood grove, home to some of the largest living creatures on the earth, about 15 miles north of San Francisco. But the towering canopy of conifers seen on-screen is much closer to the studio. In fact, it’s Robert Burnaby Park, 8155 Wedgewood Street, just south of Mammoth Studios. A network of trails through forested creek ravine, the park was built during the 1930s and is still a favourite of walkers and joggers. No stranger to the screen – Twilight: New Moon was also filmed in the park. The exterior of the ape 'sanctuary' to which Caesar is sent, is the PNE (Pacific National Exhibition) Agrodome, Hastings Street at Renfrew Street. The huge sports venue, built in 1963, previously stood in for the ‘Soviet’ arena in the climactic fight between Rocky Balboa and Ivan Drago in Rocky IV; the ‘Olympic Center’ for the 2004 ice-hockey film Miracle; and for the doggie-judging in Christopher Guest’s Best In Show. There a few glimpses of the real San Francisco. Fleeing the ape ranch, Caesar and his fellow escapees caper over Twin Peaks, two summits rising more than 920 feet above the centre of the city, before heading to liberate their comrades from San Francisco Zoo, Sloat Boulevard at the Great Highway. These zoo scenes were shot at what is left of the now-gone Vancouver Zoo in Stanley Park, a 1,000-acre oasis of greenery close to Vancouver’s downtown core. The ‘ape enclosure’ is the Old Polar Bear Den, south of the Vancouver Aquarium on Avison Way. The overhead shot, as the apes head to the ‘zoo’ entrance, is the real San Francisco Zoo, and there’s the briefest glimpse of the primates jumping aboard a Bay City trolley on Nob Hill (though the Golden Gate Bridge seems to have been moved conveniently close to downtown), but the rampage through the city is once again Vancouver. Apes appear at the junction of Hornby Street and West Hastings Street, climbing up the classical frontage of the 400 block, and massing on the roof with improvised spears. They stream down the front of the YWCA at 535 Hornby Street (which is disguised as ‘1535 Battery Street’). The Golden Gate Bridge is of course glimpsed in long-shot, but a huge section of it was reconstructed in Vancouver to accommodate the action sequences. The climatic showdown was filmed, using giant greenscreens, mainly at Kent Hangar Field at Kent Avenue and Boundary Road, south of downtown, which has also hosted filming for Mission Impossible: Ghost Protocol and Elysium. After a downbeat ending (in which Rodman was killed) tested badly in previews, the more upbeat end was reshot in that old standby, Griffith Park in Los Angeles.